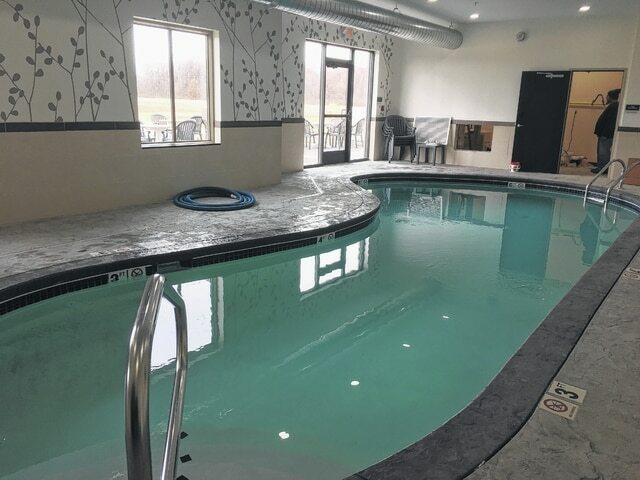 GALION — From the indoor swimming pool, to the state-of-the-art boardroom, to the Jacuzzi suites, the Sleep Inn and Suites hotel at the corner of Brandt Road and Ohio 598 is open for business. General manager Eric Pittman said the front desk staff at the 62-room hotel is already booking rooms for guests. “We are in the hospitality business, so you will not see an employee at our hotel without a smile on their face. It is our job to make people feel good,” said Pittman of the 18 employees that have been working around the clock to ensure everything is perfect for future guests. Pittman said each room will offer guests a microwave, coffee maker, iron and iron board, refrigerator and even a hair dryer. “And all of the rooms have a 40-inch flat screen TV instead of the typical 32-inch ones,” he said. Pittman said each floor has handicap accessible rooms and a variety of rooms are available, including three Jacuzzi tub suites. A free hot breakfast aso is available for guests along,with a coffee center that that juice and tea. Free wi-fi is offered throughout the property and an office center is available for guests who want to get some work done outside of their room. Plans for the hotel, 6698 Brandt Road, began about three years ago. “We started working on this not long after my term as mayor began,” said Mayor Tom O’Leary. He said the hotel will bring more business to the Galion area. “We are hoping the area around the hotel will be developed in the near future and we are already working with some businesses to facilitate that,” O’Leary said. The city constructed the infrastructure and utility services to the area. The hotel is owned by Nivea Hospitality. “Two of the three owners are former Amish and they also own the Wallhouse in Walnut Creek, Ohio, and Sleep Inns in Belmont, Ohio, and West Virginia,” said Pittman. Many of the wooden items in the hotel’s rooms are Amish-made, including closets and doors. “Our hotel is unique, there is not another one like it in the United States,” Pittman said. Pittman said he is excited to offer guests a 15-passenger shuttle van. “This will be perfect when guests want to go to Mid-Ohio for the races or visit events like the Bratwurst Festival in Bucyrus. They can relax, drink alcohol if they want to, and not have to worry about how they are going to get to and from the event,” Pittman said. The shuttle will transport guests to and from locations within a 30-mile radius, at no cost to the passengers. He is anxious to begin greeting guests. “Our goal is to provide a relaxing, clean and peaceful environment,” Pittman said. For more information, call the hotel at 419-777-7515 or visit https://www.galionsleepinn.com. Kimberly Gasuras | Galion Inquirer General manager of the Sleep Inn and Suites hotel, Eric Pittman, talks with front desk clerk, Billie Bland, on Friday before a ribbon-cutting ceremony that signifies the official opening of the 62-room hotel. http://aimmedianetwork.com/wp-content/uploads/sites/38/2017/02/web1_sleep4.jpgKimberly Gasuras | Galion Inquirer General manager of the Sleep Inn and Suites hotel, Eric Pittman, talks with front desk clerk, Billie Bland, on Friday before a ribbon-cutting ceremony that signifies the official opening of the 62-room hotel.